August 2017 Six months after the DMC’s refusal of their planning application for Knowle, Pegasus Life lodges an appeal, to be decided by an Inquiry. December 2016 PegasusLife planning application for Knowle is REFUSED by the Development Management Committee on 6th December. Knowle planning application REJECTED , on grounds of massing, intrusiveness and overdevelopment “way above’ requirements of Local Plan, etc, etc, etc. ‘After several years and various versions, the draft Local Plan for East Devon is now with the Inspector. The Inspector, appointed by the Secretary of State is Mr A Thickett. The Plan is being examined by him to see if it is “positively Prepared, Justified, Effective and Consistent with National Policy”, and is robust and evidence based. The public hearing of the Plan will start on the 11th February 2014 and last until about the 13 March. It will be held in the EDDC offices at the Knowle. The Inspector has selected a number of topics for discussion; some are related to East Devon as a whole, for example, Housing, Natural Environment and Employment, Tourism and Retail; some are specifically related to towns. 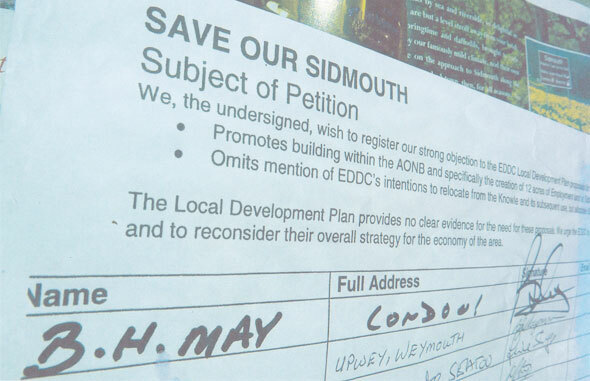 Six of the seven towns in East Devon have been given a half day for discussion, but Sidmouth has been given a complete day, we assume because of the number of written objections to the Plan and the volume of adverse comment in the town. Save Our Sidmouth, SOS), was set up to co-ordinate the efforts of major organisations in the town, for the Local Plan, and includes the Sid Vale Association, The Sidmouth Chamber of Commerce, The Sidmouth Hospitality Association, the Futures Forum and the Knowle Residents Association. We have appointed Mr C Hopkins MA (Oxon) PG. Dip. Law. a Planning and Environmental consultant, to represent us. Our work against the Plan is being funded by public contributions of over £13000, which were made after the march to the Knowle, (and which over 4000 people attended), together with a matched contribution from the Sid Vale Association. Mr Hopkins will participate in the Hearings on Housing, Landscape, Employment and of course Sidmouth. Details of the hearings and the question that the Inspector has already raised are on the EDDC Programme Officer’s web page. http://www.eastdevon.gov.uk/progofficer.htm. Those people and organisations who have requested to speak at each Hearing are listed on that web page. No one else is entitled to speak, but may attend in an observer capacity. The Hearing format will be informal, with discussion lead by the Inspector. The Inspector will begin by making a few brief comments on the matters to be covered, before inviting participants to make their contribution to the debate. There will be no formal presentations, cross-examination or formal submissions. Hearings start each day at 9.30 am. The topic of Housing, Hearing 3, will be discussed on the 12 February, Employment, Hearing 4, is on the 13th February and Natural Environment, Hearing 6 is on the 14th February. The topic of Sidmouth is will be discussed at Hearing 7 on the 25th February. The result of the Examination will be issued by the Inspector later in the year. 1. The Plan allows for 100 new houses and 50 more on windfall sites. It also proposes the allocation of 5.5 Ha of Employment land. Are these justified? 2. Are the proposed allocations suitable for the development proposed? a. Sidford; Traffic, Flooding and Landscape. c. The Knowle Port Royal and Manstone residential; Loss of Employment, Traffic, Impact on character and appearance of area. 3. Does Sidmouth have the infrastructure to support these developments? SOS objects to the allocation of 5.5Ha of Employment land, because it is not warranted and has only been justified by EDDC by the use of flawed and erroneous figures, and support from a developer. We also believe that it would exacerbate the extensive flooding problems of nearby houses, and would worsen the already difficult traffic problems in Sidford. The allocated site is also in an Area of Outstanding Natural Beauty, which the Government says can only be encroached on if there are “exceptional circumstances” for it. SOS believes that the existing Alexandria Industrial Estate is more than adequate for the levels of employment that are realistic, and that access can be improved to encourage better use of the area. We also believe that the allocation of 100 new dwellings in addition to “windfalls” (i.e not strategically planned) is not justified. Over 570 new houses have or are being been built in Sidmouth since 2006; all are “windfalls”, and such housing construction will continue regardless. To strategically allocate another 100 houses in addition to any future windfalls is excessive, (and it should be noted that, suspiciously, these 100 houses are mostly on the Knowle or EDDC’s Manstone Lane depot)..
We believe that the EDDC proposals for the Knowle and the Manstone depot are not justified because of the loss of employment in the town, and the impact on the character of the area. Some 350 people, firms or organisations have sent written Representations to the Sidmouth chapter of the Plan; of whom 27 have said that they will speak at the Examination. Supporters of the EDDC proposals for the allocation of the Sidford site are;- Fords of Sidmouth and Sidmouth Town Council Councillor D Addis, whilst Persimmon homes will be arguing for the allocation of an additional 100 houses on their land at Woolbrook. Arguing against the EDDC proposals will be SOS, and separately, the Knowle Residents Association, the Sidmouth Chamber of Commerce, Futures Forum, Councillor Ian Barlow of the Sidmouth Garden Centre and numerous individuals, including EDDC Councillor for Honiton, M. Allen. Sidmouth Town Council has written objecting to the Sidford site, but has chosen not participate in the Hearings. The stage is set therefore for an interesting time over the next few weeks; we do believe that we have a very strong case to rebut EDDC’s proposals. We would like to thank you all for your support, both physically and financially over the past two years. Thank you to all those who have taken the time to write against the Plan. Whatever the outcome we will know that we have tried our best to ensure that Sidmouth is not blighted by unwarranted development, but has still opportunities to grow in the right way. Please come along on the 25th February and see what happens! The Sid Vale Association, the Sidmouth Chamber of Commerce, the Sidmouth Hospitality Association and the Vision Group for Sidmouth have joined forces to form “Save our Sidmouth” (SOS). Our main objective is to ensure that East Devon District Council (EDDC) takes into account the wishes and comments of civic groups and the residents of the town in the preparation of the EDDC Local Development Plan. This is the plan that determines the development strategy for the next 15 years for the council area. It has specific proposals for Sidmouth and Sidford. We also wish, in the longer term, to encourage and assist Sidmouth Town Council (STC) to prepare a “Neighbourhood Plan”. The Local Development Plan is in preparation by EDDC and the last draft was published late last year for public comment. The above organisations commented, as did many individuals. EDDC are considering these and will publish their final draft in the summer of 2012. Specifically the plan proposes an employment area of 12 acres in the Area of Outstanding Natural Beauty at Sidford. They have abandoned plans to develop housing and employment at Woolbrook. Very little if any justification is given for the proposals. • The probable vacation of the Knowle by EDDC, and the effect that this would have on the town. • Any overall traffic or pedestrian strategy. Since we commented officially on the Plan, we have become aware of other, more specific, EDDC proposals, relating to the sites for new housing estates and employment land. The organisations forming SOS are not against development; we would for instance welcome some Affordable Housing in the town. However we believe that proposals in the Plan lack justification and that decisions are being taken by EDDC that do not properly reflect public interest and concerns. Astrophysicist and rock guitarist, Dr Brian May, added his name to the Save Our Sidmouth petition, making the point that Observatories can’t fully function without Dark Skies. On his first visit to the Norman Lockyer Observatory in 1960, that was already a problem. But the 12 acre business park (on AONB land at Sidford) in EDDC’s proposed Local Development Plan, would add another area of light pollution, affecting the NLO’s increasingly important work. At the Observatory’s Centenary Celebration on 20th May this year, Dr May officially opened the splendid new Connaught Dome, which was funded by local sponsors including the Town Council, to house the Newtonian reflector telescope, donated by NLO Chairman, David Strange. Yet thirty years ago , the NLO site risked being sold to developers! Owners of the land since 1984, EDDC have made the far-sighted decision to support the Observatory, for the public good, and the importance of that legacy is clear. Sir Patrick Moore also kindly signed the SOS petition, being concerned with the Dark Skies issue. Large scale development in the Sid Valley would inevitably affect telescope viewing at the renowned Norman Lockyer Observatory (NLO). Note from SOS: Sir Patrick More, who has since died, had links with the NLO. His point was again raised in 2016, when NLO members voiced strong protest against the proposed large-scale planning application by Fords of Sidmouth, which was rejected. SOS and individual supporters are gathering substantial evidence against EDDC’s plans for the Sid Valley area. Please refer to DOCUMENTS, and Case Studies.